I doubt I’d surprise anyone by admitting that the main reason I was drawn to Pittsburgh’s Crazy Mocha coffee shops was their goat logo. I mean, come on. Goats! Even though they’re the least likely animals I’d associate with beverages, read on to find out why Crazy Mocha was all kinds of right! 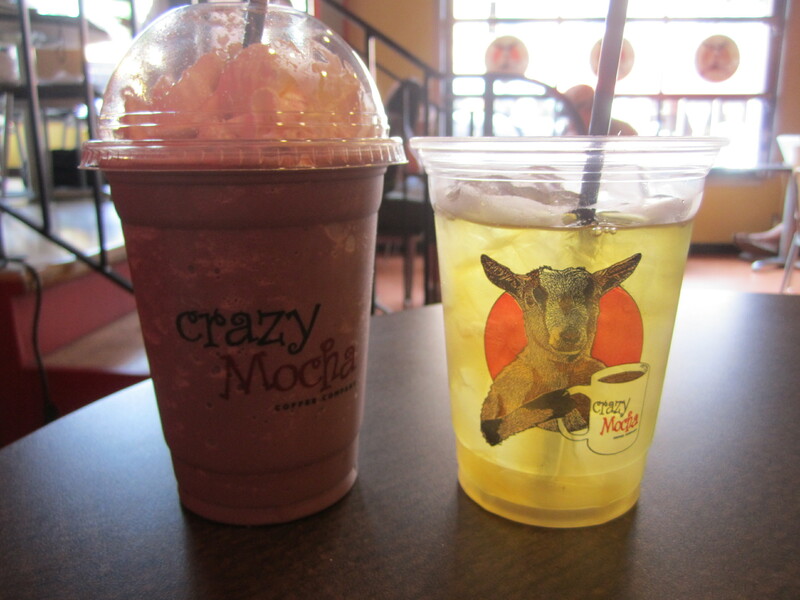 Pictured are the Cookies and Cream Smoothie (left) and Moroccan Mint Iced Green Tea, which should show you the expansive range of products you can pick up at Crazy Mocha. The prices are spot on (even cheaper than Starbucks) and the selection is absolutely endless. (I stared at the tea list for a good ten minutes before deciding on a yummy patriotic Red, White, and Blueberry hot tea on my second visit.) The Moroccan Mint Iced Tea was definitely my favorite. It tasted super fresh somehow: like the first few seconds after you pop a piece of minty gum. I take all my teas unsweetened, so I appreciated that the teas had actual flavor to them on their own. Cookies and Cream was too sweet for me: definitely not my thing. But it’s a really fun combo and my boyfriend gulped down like, three of them, in the week I was visiting Pittsburgh. I’ve never heard of a cookies and cream smoothie before, but it seems like a great option if you’re looking for a sweet treat but don’t want coffee-flavored frappacinos. The atmosphere of all the shops is really chill as well. They have free wi-fi and plenty of tables with access to plugs, and no one is going to chase you away if you buy a coffee and sit down to write a novel. Fans and customers range from small kids wanting sweet treats, young hip college students craving some caffeine, and older folks enjoying a break from the city. I brought home a 1-pound bag of Crazy Mocha’s house blend coffee beans for my family to try. The bag itself smells amazing, and we can’t wait to grind it up. I thought this was a nice souvenir to bring home, since the brand is Pittsburgh-exclusive. Let us know if you’ve tried out ‘the goat’ — or if you’re dying to check it out on your next Pittsburgh trip.